One of my personal hopes in this journey to Gangjeong and learning from their 3211 days of continual resistance was to better integrate body and spirit. That opportunity came on the opening day of the naval base but with the caveat, be careful of what you wish for. 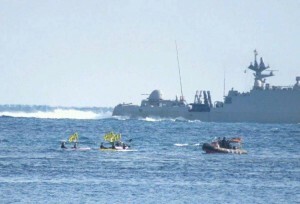 I was invited to join members of Frontiers, a Korean peacemaking organization in Gangjeong to take kayaks decorated with yellow “no navy base” flags for a protest on the sea. Four of us “set sail” in the midst of activites related to the Dedication of Gangjeong village as a Culture of Peace and Life. Our intention in setting out to sea was to bring a message to the navy that they were not welcome here in Gangjeong. Earlier in the day on a trial run we were followed by police and recorded but now there were 8 police boats with 8 officers in each boat as well as many large coast guard vessels strategically placed around the entry of the port. Right away I was feeling regret for having expended so much energy in the trial run but once we turned the corner to see the nava entry to the port there was no place in the world I would have rather been. The perspective was astonishing. Here I was in this tiny plastic kayak on this vast sea with a futuristic port filled with mammoth, monstrous warships. It was a lot to absorb. I was feeling very humbled. The pesky police boats kept playing an annoying siren and warned us if we entered into the naval waters we would risk a $5,000 fine and 6 months imprisonment. 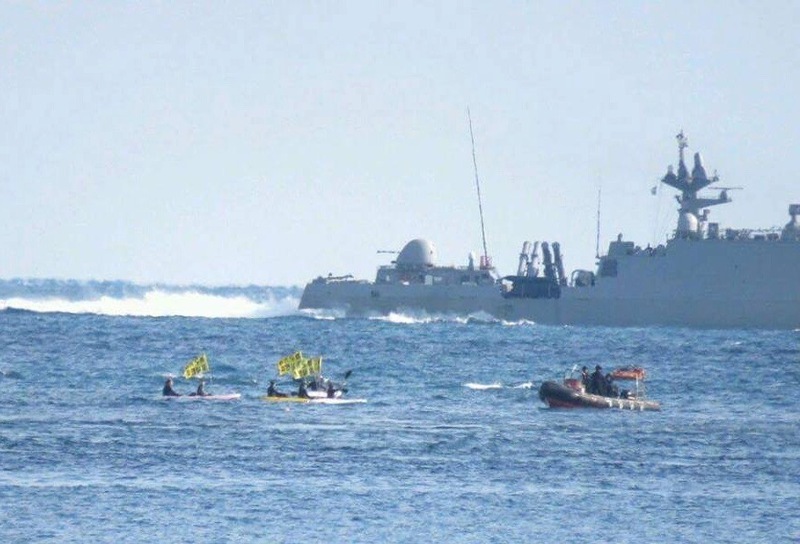 We maintained our presence in our four small boats affixed with our simple message in the vast sea when military helicopters and warplanes flew overhead as part of the theatrics of the war glorification happening at the base. The feeling of vulnerability intensified and all I could think to do was to raise my fist in solidarity with all the people resisting war throughout the world especially those who experience death and destruction coming from these machines. Throughout the journey, I found myself thinking of the words of Dan Berrigan, “There are no makers of peace because the making of peace is at least as costly as the making of war- at least as exigent.” I began to have a deeper appreciation for the persistence of people of Gangjeong and the vastness of our struggle against militarism. Many of the people involved in the save Jeju campaign have a small yellow flag that they wear that symbolizes their commitment to the struggle here. It represents the totality of the life force that the people have devoted to the struggle even if it means dying. I have meet some of the most passionate, steadfast makers of peace here in Gangjeong. The creativity and love is manifest everywhere. They are not simply resisting the naval base but rather have embodied the beloved community.